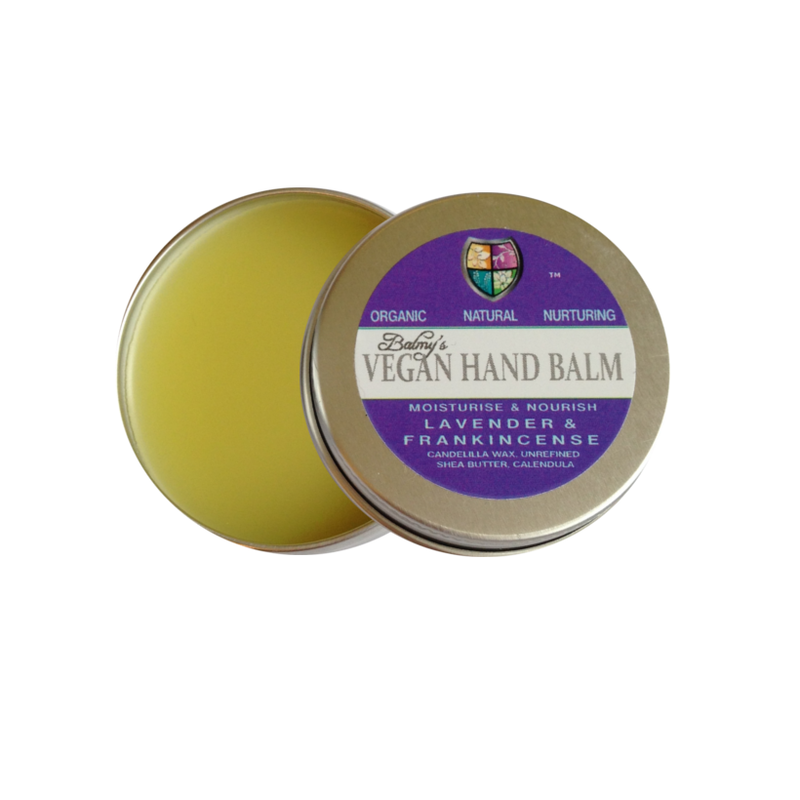 This vegan hand balm has been made using Candelilla wax and has the wonderful aroma of organic Lavender and Frankincense essential oils. 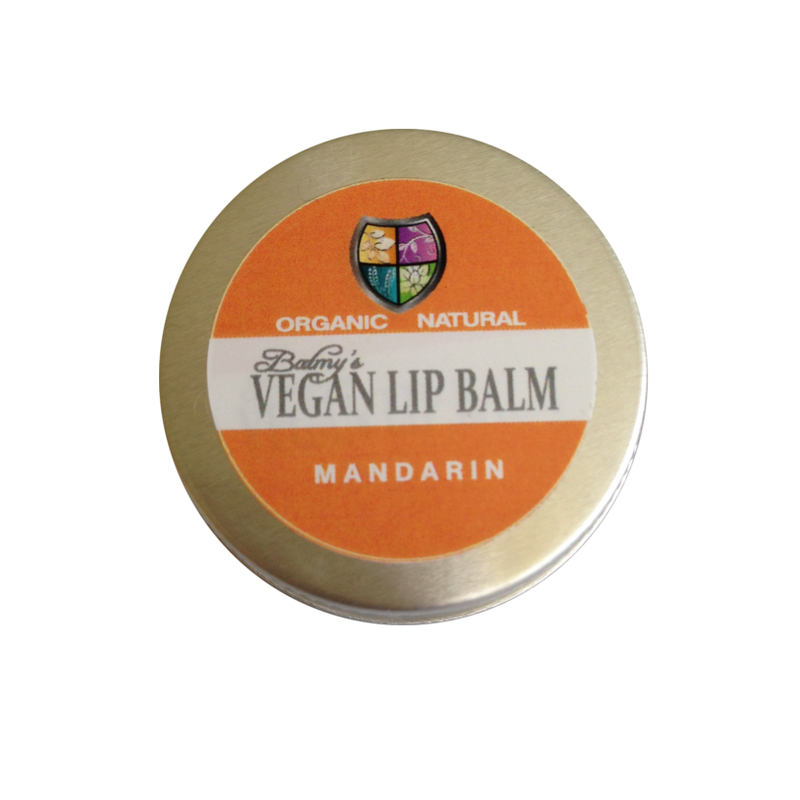 A moisturising base of organic unrefined Shea butter and hand loving Calendula to care for your hands together with a blend of organic vegetable oils and vitamin E. A solid long lasting balm. Melts on contact. 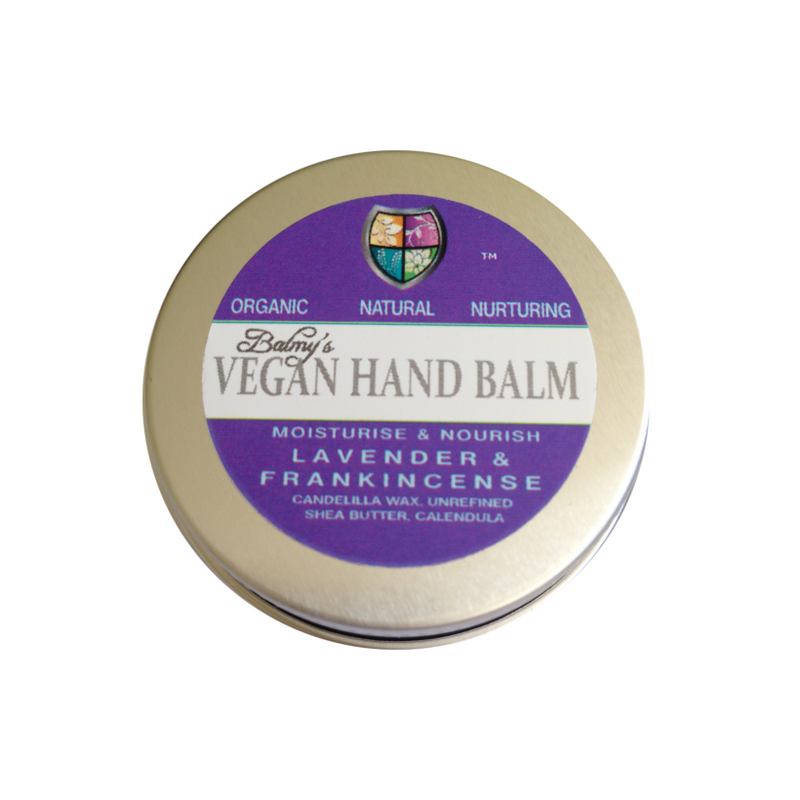 HOW TO USE BALMY'S VEGAN LAVENDER & FRANKINCENSE HAND BALM; Apply a small amount and massage into your hands until fully absorbed for beautifully soft skin. INGREDIENTS; * = Organic, Allergens are natural derivatives of essential oils. * Olea europea oil, (Olive oil), * Helianthus annus oil, (Sunflower oil), * Butyrospermum parkii butter, (unrefined Shea butter), * Calendula officinalis oil, (Calendula oil), Euphorbia cerifcera, (Candelilla wax), * Lavandula augustifolia oil, (Lavender oil), Tocopherol, (Vitamin E), * Boswellia carterii, (Frankincense oi). PACKAGING; A fully recyclable aluminium jar. JAR SIZE, SHELF LIFE AND STORAGE; 25ml jar approx 50mm diameter x 20mm depth. Store dark & cool. We advise using within 12 months of opening and by the best before date for optimum benefits. This is a wholely natural product with no preservatives, therefore shelf life can vary depending on storage. Should there be any change in aroma or effect please discontinue use. Can melt if left in heat.